The Valley of The Firelands - Why Join? Why did your Lodge vote to admit you? Because, after due examination, they made a unanimous declaration that you are a good man and true. Why did you seek admission to the Lodge? Perhaps you had heard about the good work Masons do in the community. Maybe the men in your family have a Masonic history. You might even have been intrigued by the aura of mystery surrounding the Masons and their degrees. Whatever the reason, you applied, and were initiated, passed, and raised to the degree of Master Mason. That is a question the Scottish Rite can help you answer. Masonry is a brotherhood of men who seek to live by the precepts of brotherly love, relief, and truth. Masonry strives to make good men better. How? In part, it does this through the interaction of members with each other so that, through brotherly love, the imperfections each of us have as rough ashlars are gradually removed to reveal the smooth ashlar within. A second way good men are made better is by watching and participating in the three Blue Lodge degrees again and again. Each time a degree is witnessed, it is seen through new eyes and heard through new ears because men change over time. We grow. We mature. And the man who sees the Master Mason degree today is not the same man who saw it 20, 10, or even 1 year ago. Each time a Mason sees a degree, something can be seen or heard that puts the entire degree in a new light. And that light can be carried out of the lodge to more clearly illuminate his path in daily life. This is where the Scottish Rite can help. If three degrees can help teach the ways a good man can be made better, imagine the difference 29 more degrees can make! Like the three Blue Lodge degrees, the Scottish Rite degrees teach lessons, and like the Master Mason degree, they teach them through allegories or stories. The Scottish Rite degrees boost a Master Mason knowledge and understanding of how to be a better man. They accelerate his learning by presenting Masonic principles from various perspectives and letting him see the principles in action through both good and bad examples of living. And, like the Blue Lodge degrees, Scottish Rite degrees are best savored through repetition. Each time a degree is seen, something new can be learned. 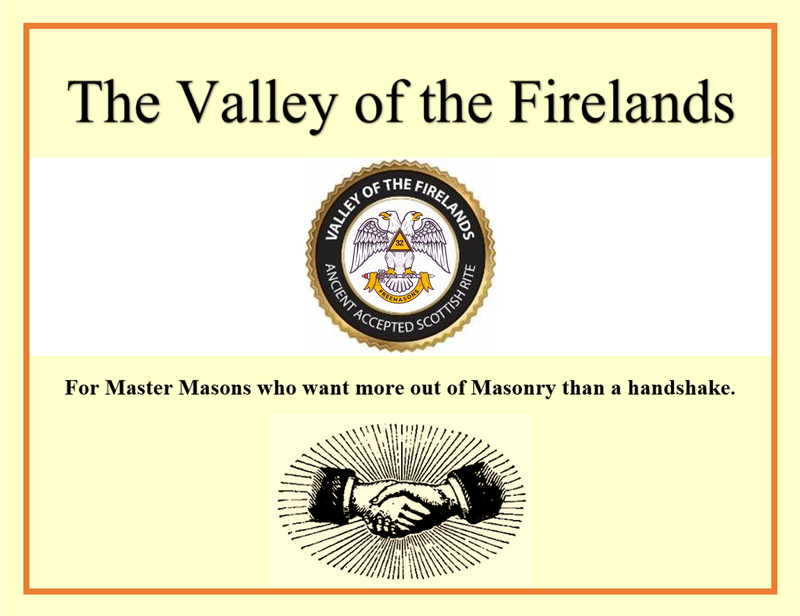 The post-degree discussions in the Valley of the Firelands add to the learning by letting you hear what other men have taken form the degrees who have family, vocational, and personal interests similar to yours. This shared perspective amplifies the learning and helps make each degree a personal learning experience you can carry into your daily life. The Scottish Rite is an investment that will pay dividends in your personal life for years to come. We welcome you to begin your journey of personal discovery with the Valley of the Firelands.